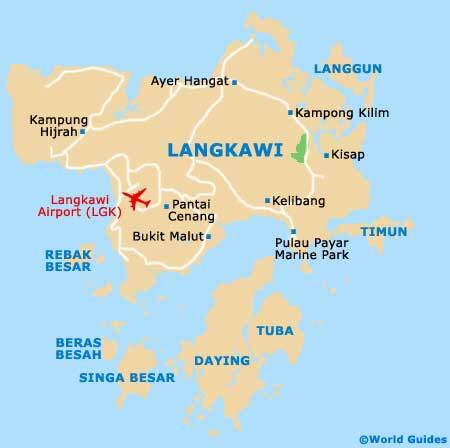 Langkawi is as far north as you can get in Peninsula Malaysia, being located off the north-west coast, near Thai territory. It consists of an archipelago of around 100 islands (depending on the tide), with Langkawi Island (Pulau Langkawi) being the main island. This is where the Andaman Sea siphons down into the Straits of Melaka. The principal island is about the size of Singapore , although much of it remains undeveloped and is clad with jungles and hills surrounded by sizzling beaches. A road roughly loops the island and goes between the main town of Kuah and the beach resorts. It is best to pick up maps of Langkawi to understand the layout of the island. Kuah town is in the south-east, with the most popular resorts of Cenang, Tengah and Kok lying either side of the airport in the south-west. You can walk these areas. Kuah is a couple of kilometres end to end and comes with a jetty and a thicket of streets in the town centre. 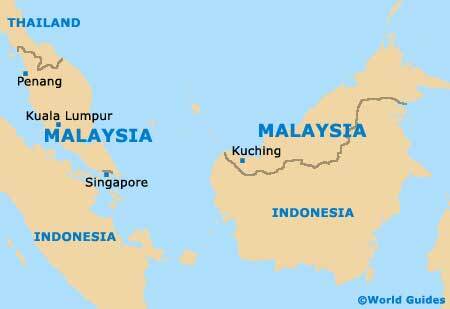 Kuah maps and also island maps can be obtained from the Langkawi Tourism Bureau at the airport and in the town itself.